Are geothermal heat pumps proven technology I can rely on? Are there many companies that make this high-tech equipment? How can I compare information about equipment models? Texas homeowners have long used traditional gas and electric heating and air conditioning systems to keep their interior spaces comfortable. As fuel and electrical power prices have continued to climb, so have their energy bills. Today, more and more residents of the Houston and Dallas Fort Worth metro areas, along with the San Antonio area, are choosing environmentally friendly geothermal HVAC systems instead. By taking advantage of the residual heat stored below the ground, they’re saving up to 80% on their monthly energy bills and enjoying outstanding heating and cooling comfort. Many Texas air conditioning companies now recommend, supply and install these systems. Their customers give them high marks for comfort and extremely economical operation. Since the geothermal technology is quite new to the market, most property owners aren’t familiar with it. Here, you can learn the facts about heating and cooling your home for less. You’ll find information on how these systems work, what’s involved in installation, how much they cost initially, and how much they can help you save on your energy bills. If you want to learn more about this green technology, you’ll find the answers to your questions here. For more details and specifics, you can find licensed, trusted HVAC contractors near you in our extensive directory. They’ll be happy to consult with you and give you a thorough consultation and price quote. Unlike conventional residential HVAC systems that burn fuel or use electricity to keep you comfortable, this new, environmentally sound technology takes advantage of the constant temperature of the earth on your property. 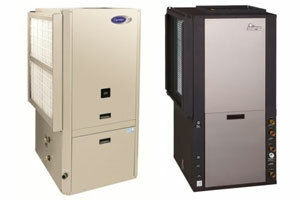 Using a refrigeration-cycle heat pump, it transfers heat energy to either heat or cool your home. Water pumped through buried plumbing loops buried deeply near your home takes advantage of that residual heat to power the process. The result is low-cost of operation and less waste of fuel and electrical energy. Systems are available for all types of homes, both new and older. Most of the installation of these energy-saving systems for new or replacement needs is similar to installing a traditional furnace and air conditioner. The main difference is the installation of heat transfer plumbing underground. The buried horizontal loops of special tubing or vertical loops in deep, well-like holes require excavations. If you have a substantial body of water nearby, an energy transfer loop can be installed in it as another option. This piping is connected to the equipment installed inside or outside of your home. After installation, normal landscaping completely hides the buried loops. Whether you’re building a brand new, custom home or need to replace the heating and AC system in an existing home, you can take advantage of this revolutionary technology for saving energy. These heat pumps are available for all types of installations, from forced air installations with ductwork to hydronic systems that deliver warmth and cooling through interior plumbing in floors. Models are even available that work with an existing furnace and air ducts to create an energy-efficient hybrid solution that gives you big energy savings. The exact combination of equipment you will need and how it will be installed depends on your home’s design and energy needs. A free consultation from a Texas AC company can help you decide. How Much Do Geothermal HVAC Systems Cost in Texas? For most homes, the cost of a new system’s equipment is comparable with other HVAC equipment pricing. However, the need to excavate and bury heat transfer plumbing does add substantially to the initial price, compared to traditional heating and cooling. Typically that additional cost is paid for in 3-5 years through big savings on energy bills, though. After that payoff period, your savings in operating costs are like money in the bank for many years to come. The exact cost of a geothermal heat pump system can only be determined after a thorough evaluation of your home and property. The main reason to choose this advanced HVAC technology comes from lower energy bills over the lifetime of the system. Typical Texas homeowners see their monthly energy bills cut from 35-75% after installing a geothermal heat pump system. Those savings can be as much as $2,000 per year. It’s easy to see how you can recover the initial extra cost of equipment and installation in just a few years, and continue saving over the long-term. True value of any investment in your home can only be measured over time. In a consultation with your local HVAC contractor, you’ll get a customized calculation for your unique home. Even though this money-saving HVAC equipment is relatively new on the market, reliable, efficient systems and equipment are available from many manufacturers, and include outstanding warranty protection and a history of top performance. From traditional heating and air conditioning manufacturers like Carrier and Trane to innovative specialized geothermal companies like GeoComfort, WaterFurnace and ClimateMaster, you’ll find an ideal solution for your home in Houston, Dallas Fort Worth or San Antonio. Read our guide to manufacturers and specific model lines. Compare features, warranties and cost information. The comprehensive directory of residential HVAC contractors on this website lets you locate an solid, established company to help you with all heating and air conditioning needs you may have. Many of these listed companies supply and install high-quality ground source HVAC equipment across Texas, from Haltom City, Crowley and Kennedale to Desoto, Frisco and Rosenberg in the Dallas Fort Worth area, from Conroe, Pearland and Tomball to Bobville, Bonney and League City in the Houston area, and from Alamo Heights, Timberwood Park and Amphion to Fentriss, Sutherland Springs and Quihi in the San Antonio area. Ask the dealers you contact about a consultation on a new installation for your home and compare the costs, savings and benefits before making an informed decision. In a free consultation, you can get the information and advice you need to make the right choices. Should You Consider Geothermal Technology for Your Home’s Comfort? Before making any decision about heating and cooling systems for your home, you should get complete information about all of your options. We want to help by providing accurate, objective facts about all types of home HVAC systems, including today’s geothermal technology. On the pages of this website, you can educate yourself on the benefits, cost comparisons and features of all types of equipment from a wide range of manufacturers, including WaterFurnace, GeoComfort, ClimateMaster, Trane and Carrier. With that information, you’ll be ready to contact a local heating and air conditioning contractor in your local area, using our business directory. They’ll be glad to help you with exact price estimates and accurate evaluations of your home’s requirements.